This contemporary 3+ bedroom, 4.5 bath deck style home could be right out of Architectural Digest! 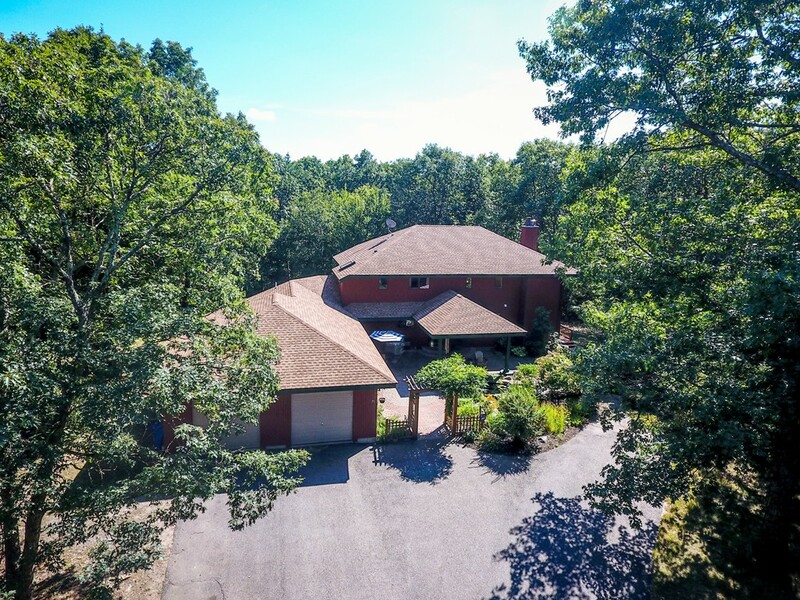 3 levels of living space with wrap-around decks, patios, and 6 private acres. The courtyard & portico entry has a truly amazing array of professional landscaping including a waterfall, brick stonework & Koi pond. The remodeled kitchen boasts granite flooring, granite counter tops, stainless steel appliances, custom cabinets and an island. Huge 12x15x12 fir covered deck. Step down to your cathedral, beamed ceiling living room w/hardwood floors, stone hearth & woodstove. There is a 25X12 room directly off the 1st floor laundry room that could be used as a playroom/workshop area with a mini split for heating/cooling. Great master bedroom with sitting area, balcony and 2 room bath with skylight. The walkout basement features 3 finished rooms plus a full bath. 2 stall barn has electricity; just add your paddock. 2 miles to shopping/dining, approx 14 miles to Rte 2, 3 or 495.